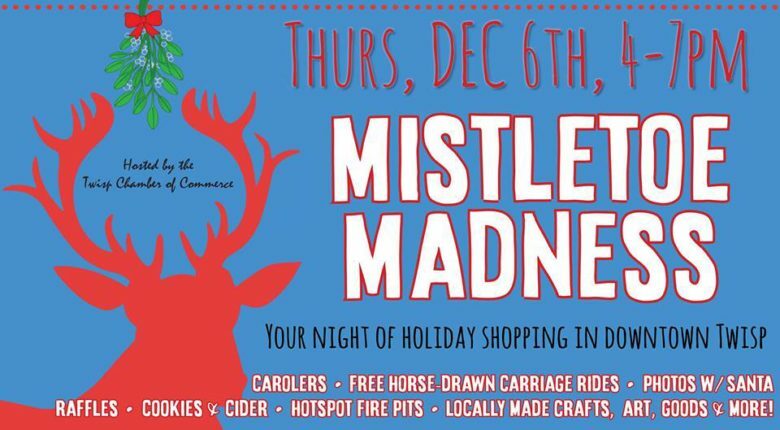 Jingle Yourself all the way down to the heart of the Methow Valley for Twisp’s Annual Holiday Shopping Night! Businesses all throughout downtown Twisp and TwispWorks will be open from 4-7pm to offer discounts, drawings, cookies, cider and plain ol’ holiday cheer. There’s no better place to find local fare, from wine to chocolates to pottery and paintings. You’ll find everything you need on your wish list! Follow Santa and his belly full of joy down Twisp’s main street, throughout participating businesses. At 5pm, Santa will hop on a real horse and carriage to fly down to Hank’s Harvest Foods, where the community can enjoy food, a firepit and holiday photos. Large candy cane poles and hotspot fire pits mark stops for our horse drawn carriage, which will take you on a ride throughout a festive downtown Twisp for free! • Gear up For The Holidays at TwispWorks! Fa La La La La Low along to the TwispWorks campus at the south end of Twisp’s main street for even more music, food and holiday cheer. We can’t wait to see you Rockin’ Around our Christmas Street for some merry Happy Holidays shopping!